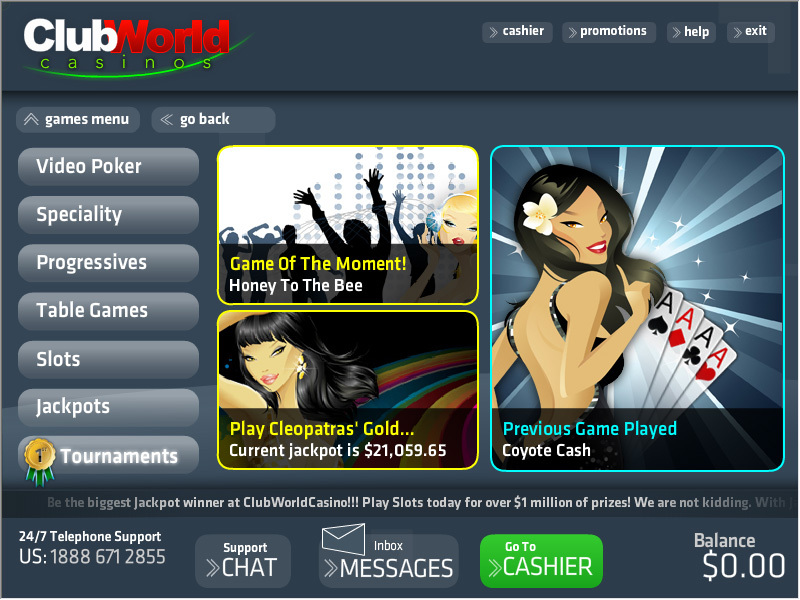 Club World Casino started the Club World group of casinos, and they are well known for being fair and trusted. No worries about getting paid your winnings here. They offer a 100% welcome bonus, and the best slot tournaments I have ever played at. This online casino is the first to get the slot tournament right and, in my opinion, all casinos should take a lesson from the way Club World set them up. If you play MicroGaming tournaments, you will know that it is very tough to win because there are so many continue options. This allows people to buy their way to the top of the leader board, and makes it impossible for someone that just plays the initial round to win. I played in a FREE tournament at Club World Casino and to my surprise, there were no continues! Everybody had one shot and it was free for everybody, nobody could buy their way to the top. I hit big and easily made it to the top of the leader board, and I won the top prize of $250! I was so used to playing at MicroGaming tournaments that I really didn’t expect to win, even with a sizable lead over everyone else. When the tournament was over I was shocked to find that I was still in first place. I was paid my winnings and able to immediately cash out, that’s something that some other RTG online casinos don’t allow for free tournament wins, often the winnings are treated like a bonus. Most of their paid tournaments operate the same way. When you buy in, you know that you will have a fair chance without having to pay more to climb the leader board. Some people like to continue for legitimate reasons like being in the middle of free spins, but it is too easily abused by people buying their way to the top. The lobby is well laid out and easy to navigate, and getting to the bank or your favorite games is very simple. Cash-outs are processed very quickly, just like the other casinos that are backed by this group, and customer service is second to none. I can’t stress enough how important quick cash-outs are, I really enjoy cashing out after a night of playing to find I have been paid by the time I wake up. Club World Casinos never disappoint. Players from most countries, even the US, are welcome to play here and Instadebit is an available banking option for us Canadians. Play at Club World today and enjoy playing at one of the best RealTime Gaming casinos out there.